Most manufacturers develop a circuit for their power amplifier and then use the design for their preamplifier. The job of a power amplifier is to amplify the signal and drive the loudspeakers. That of a line preamplifier is to draw together the various source components; to attenuate the signal in order to achieve "volume control"; to have low enough output impedance in order to drive the cables; and finally, to provide gain if it is required. It performs totally different duties to those of a power amplifier and needs to be designed in a totally different manner. Conventional wisdom suggests that the most critical part of a preamplifier is the active circuit design. Ypsilon, however, believe that the means of signal attenuation (the volume control) is the most critical to the overall sound of a preamplifier. Most designers use resistor attenuators for volume control. Ypsilon themselves have used resistor attenuators with high quality resistors (Vishay, Holco, tantalum types etc.) in the past, but that was before they developed a very special transformer as the means of attenuation. It was immediately apparent just how grainy and discontinuous resistors sound, even the best of them. The short explanation of this observation is that the series resistor transforms the constant voltage into current and the parallel resistor the constant current into voltage. The materials used in resistors are far from ideal as conductors... they sound much worse than pure copper or silver... and they do a lot of harm to the signal. The active gain stage is a no – feedback s.e. triode, transformer coupled. The power supply uses valve rectification and choke regulation. Wiring is made with custom made pure silver wire. The transformer attenuator is placed after the valve stage, preserving the purity and micro details of the signal. The maximum attenuation is 52db and maximum gain is 12db. Output impedance is 150 Ω max. PST is the pinnacle in preamplification. It is a must have component for building a “no holds” system. 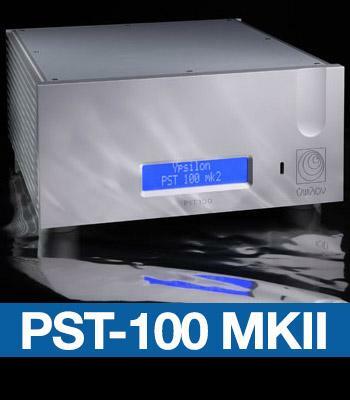 PST100 is also available without the valve stage for systems that don’t require additional gain. This version is equipped with the transformer attenuators and is called PST 100 TA. Notice that it is fully upgradeable to the full version at any time by returning to factory.